We are a family, a large-Italian-family, and we have a great passion for our Country and for the land where we live or from where are our origins. As it often happens in Italy, we have different bloods in our veins: my father’s family is from Tuscany, my mother’s is Sicilian, and we live in Liguria, where my sister and I were born. At today it’s the two of us who cares of our family properties and we offer them to our guests exactly as per our Italian way of living, even if with some help from the new young growing “third generation”. Every year, on the 17th of August, Portovenere celebrates its local Patron Saint called White Madonna (Madonna Bianca). Vernazza celebrates the traditional Feast of St Margaret of Antioch on July 20th. During the day you can find several stalls in the main street of the village, whereas in the evening there are spectacular fireworks. We found the house after a kind lady helped us. It was in impeccable condition and ideally located. It is a beautiful home with stone walls, and wood beam ceilings, very gracious. We were eight family members and enjoyed our stay immensely. The location was perfect for us as we were visiting our past home in Marina di Pisa and wanted to explore the Tuscan hills in the area. It was an easy commute to Florence and Siena. We enjoyed several meals together on the porch which was covered and very comfortable. A true highlight for us was watching our three grown children sitting together on the lawn watching the magnificent sunset on our first night at the villa. Thank you for a memorable stay and we hope to return again someday! 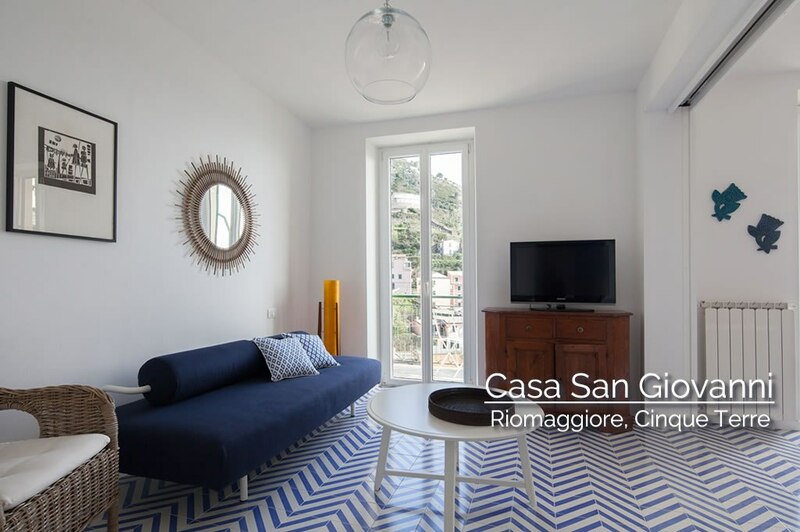 Casa San Giovanni Riomaggiore: Perfect apartment, perfect location, perfect setting!! The apartment had everything one would need. Yes, it is on the 3rd floor so be aware of some climbing with suitcases. But once you are there, you will be rewarded with a beautiful sight overlooking the sea. Truly spectacular with a great location. Would be back in a heartbeat! 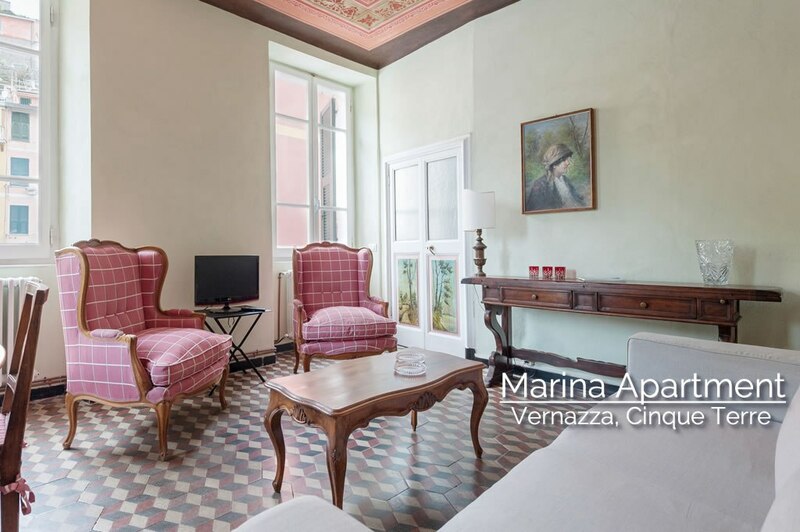 We felt very privileged to have one of the few rental apartments available in Vernazza. The location could not be beat with big picture windows overlooking all the action in the main square and the ocean beyond.The apartment was comfortable with everything that two couples could need. The Wi-Fi was excellent and the communication with management regarding key pick up etc. was straightforward. In short, you won’t find a more perfect place from which to explore the Cinque Terre. The best apartment we've stayed in all of Italy. Clean, modern, updated, very usable kitchen, and the best views one could have in Riomaggori!!!! Would highly recommend. Beautiful apartment with stunning views. We started to feel like locals. Was nice to be able to walk outside and take a dip in the sea, rent a kayak for a few hours and relax in the square. Highly recommended. Cristina’s apartment is in the best location in Vernazza. It overlooks the square and has beautiful water views. Cafés, restaurants, supermarket, delis, boutique shopping are outside the door. The train station is a 5 minute walk. The apartment is a very comfortable 2 bedroom, 2 bathroom spacious and comfortable place, with windows providing beautiful water views. There are plenty of places to swim and walk to explore the surrounds. Vernazza is the prettiest village in the Cinque Terre and a great place to relax. Podere in Tuscany: Las vistas desde el porche son impresionantes. This is the most beautiful Italian apartment and the location is perfect. Our family of four stayed here comfortably. The village was small enough that we were comfortable leaving our 10 and 13 year olds home while we had dinners out. We swam daily in the cove. She had a large drying rack for an entire load of laundry which was convenient. We can’t wait to come again! We had a great time in Vernazza. This apartment was wonderful and had everything we needed. It was in a great location. We would definitely stay here again! Great communication from our host Cristina from booking to arrival. We had a very busy itinerary following my daughter around Tuscany during her school’s choir tour, so this property was always a welcome sight after many hours on the road. With its beautiful views and architecture it was what we expected. We had no need to communicate with our host during our stay as we had everything we needed, very clean, plenty of room and all the amenities required for a relaxing stay. Many thanks Cristina, hope to stay again when we return to Tuscany soon. This place was a dream cone true. The view is amazing, the host was great and the location was perfect. I would go back there anytime I am in Lerici!!! Beautiful place very close to Cinque Terre. It provides everything you need and is surrounded by an amazing garden. Definitely recommended! Great experience, beautiful place, grazie Cristina! Podere in Tuscany: Superbe demeure ! Nous avons passé une semaine dans cette magnifique demeure idéalement située en plein coeur de la Toscane. La maison est encore plus belle en réalité que sur les photos ! L'intérieur est vaste, très propre et dans un style toscan, le tout au cours de la nature toscane ! Elle possède 2 immenses terrasses qui permettent de profiter des longues soirées d'été ! L'environnement est très calme. Idéal pour partir en famille avec des enfants ou avec des amis, l'espace intérieur comme extérieur permet de ne pas se gêner du tout ! Vraiment rien à dire c'était parfait ! Nous reviendrons !!! What a beautiful place! Great house whit everything you need. Beautiful garden with swimming pool and tennis court. We couldn't wish better. Absolutely recommendable! Casa San Giovanni Riomaggiore: Amazing place! Staying here was a great experience. The house is very comfortable and very nicely decorated. 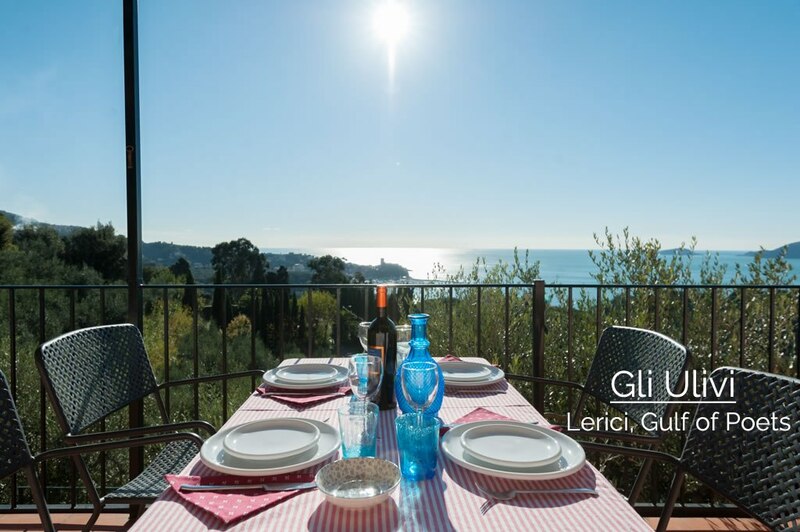 The location is perfect-very centrally located and easy access to the train to see the other villages of Cinque Terre. I would highly recommend this place. Also, communication is great and provides detailed directions for finding the home. This is a magic place with an unforgetable view in a garden like "Garden Eden". We have never been at a location like Gli Ulivi. And we are Italian specialists :-)) - from Ponza to Sardegna - from Trento to Marcche. We really enjoyed every minute - - - - Thank you so much for the great time on your 'island'. We would like to come back as soon as possible. Marina Apartment Vernazza: Great stay! Everything was perfect : location, charm, comfort, equipment, space , view... You've got a great place Cristina and this is the perfect spot to go and discover the enchanting Cinque terre ! We hope to come back one day. The house is exactly as pictured and simply breathtaking. We had the best time with our three kids! Two of them were crying that we had to leave. Wouldn’t hesitate to recommend - you won’t be disappointed! my husband and I had lovely stay we went for sun and relaxation and that is exactly what we got.we were met by cristina the owner who was very helpful and friendly,our apartment was beautiful, spotlessly clean with lovely furnishing.the view was to die for we had lovely evenings just sitting on the verandah with a glass of wine drinking in the view.we went into lerici for lunch in the piazza amazing food also had dinner a couple of nights in lovely restaurants.lerici is quite hard to park but there is info in apartment about buses in and out.would highly recommend this lovely apartment very central for visiting the cinque terre,boat trips leave from lerici. This house is gorgeous and just amazing. The scenery, the decor, and the host were all perfect. I visited as a family of six people, and we loved it. The house is old but very well maintained and cleaned. It is well equipped that we could even enjoy a last night barbecue and had lots of fun. Although there is no air conditioning, the temperature at night is cool enough that it was very pleasant. There is a pretty large supermarket 3minutes by car from the house and in 20-30minutes you can get to lots of local restaurants that have wonderful service and food. The host is very responsive and helpful. She helped me reserve a nearby winery tour and answered all my questions within minutes. The host felt very professional at her job and it was one of the best Airbnb experiences I’ve ever had. 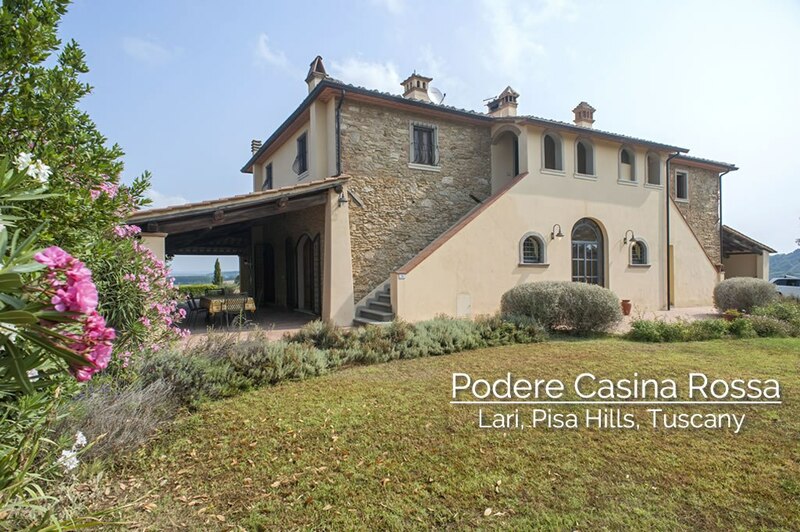 If I were to visit Tuscany again, this bnb would be THE place I would want to stay at. Four nights felt too short! Marina Apartment Vernazza: Excellent location, wonderful view of harbor, wasn’t quite prepared for our arrival. We absolutely loved the location and views of the harbor. The property was very nice, but it didn't seem like the owners had fully prepared it for our arrival. The room was very cold (the heat had not been turned up), the bathroom soap dispenser was virtually empty, and the toilet was dirty. That said, the property was very comfortable and is in a great location. We really enjoyed our stay, and would recommend this property to others, but would have liked a little more cleaning/preparation of the property before we arrived. Podere in Tuscany: Schönes großes Objekt! Großes Objekt, landschaftlich schöne ruhige Lage, entspricht völlig der Beschreibung. Großartige sehr geräumige überdachte Terrasse, die wir die ganze Woche genutzt haben, so dass wir agr nicht dazugekommen sind, das schöne Wohnzimmer und den Kamin zu nutzen. Geräumige, sehr gut ausgestattete Küche mit großem Gasherd und großem Kühlschrank und alles was für die Selbstversorgung nötig ist. Großes Objekt, landschaftlich schöne ruhige Lage, entspricht völlig der Beschreibung. Großartige sehr geräumige überdachte Terrasse, die wir die ganze Woche genutzt haben, so dass wir agr nicht dazugekommen sind, das schöne Wohnzimmer und den Kamin zu nutzen. Geräumige, sehr gut ausgestattete Küche mit großem Gasherd und großem Kühlschrank und alles was für die Selbstversorgung nötig ist. Ideal für unseren Herbsturlaub. Very nice and clean apartment and the view is stunning. One of the most beautiful places I've ever been! Simply perfect! Cristina's home is as beautiful as the pictures show! The terrace is the perfect place to start and end your days in beautiful Riomaggiore!